Few countries can claim their hotels as one of their main tourist attractions. Japan is different. Staying in a traditional ryokan provides insight into what Japan values: simple, well-made food, courteous service, tradition, a place that feels like home. No one travels in Japan more than the Japanese themselves. Part of this is due to the values listed above, and part of this is because of the natural hot springs that dot the islands. Weekends at a hot spring resort are not just common, they’re a necessary respite from the stress of urban living. Knowing this, it’s safe to say that the country’s best ryokan are located near the country’s most popular natural hot springs. 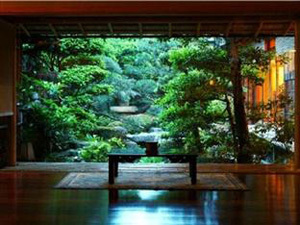 And so we come to Nishimuraya Honkan Ryokan, a traditional yet luxurious basecamp in Kinosaki-cho, Japan. Designed by renowned 20th century architect Masaya Hirata, the Sukiya-style design houses open-air baths, natural hot springs, traditional gardens, and supremely comfortable rooms to eat and sleep in. 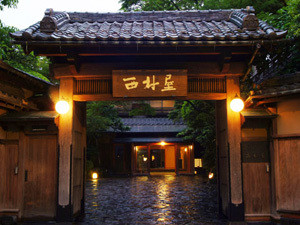 Kinosaki’s natural hot springs, or onsen, boast a documented 1400 year history of relaxing travelers. The inn itself is nearly 150 years old and features a history of its own. There are no extraneous frills here, just the best of what tradition has to offer. Enjoy the mouth-watering meals featuring delicacies like Tajima beef, Matsuba crab and Konotori rice. Seasonal offerings include red snapper in spring, abalone in summer, and red tanner crab in autumn. The service of the lodge staff, unsurprisingly, is perfect. The rest of the world could take notes on Japanese service. You will feel taken care of and at home, even if you don’t quite understand the language. Nishimuraya is a place from which to observe the changing seasons that are so vibrant in Japan. Cherry blossoms give way to verdant green, change to bright oranges and reds in autumn, and on to the stark white snow of winter. This place may not be the most exciting place you visit in Japan. But it might be the most Japanese place you visit. Sit back, relax, maybe meet a Japanese family on weekend getaway, and take joy in what the Japanese have known for centuries. Simplicity, executed perfectly, is an art form worthy of praise.